I’m back in the UK and blogging after two weeks of fresh air and exercise on the snowy slopes of Sun Peaks in British Columbia. And while the dearth of internet options up a mountain was a bit of a setback it did mean I got to read lots of so-called dead tree media, including the Vancouver edition of Globe and Mail, Canada’s largest-circulation newspaper and acknowledged paper of record. 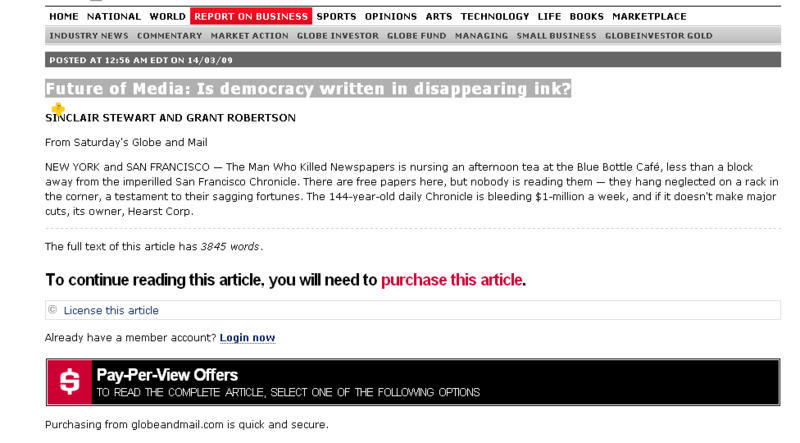 And among the articles it ran was an exellent piece entitled Future of Media: Is democracy written in disappearing ink? which I found fascinating. I recycled the paper, figuring I could search for it online once back home and save it to Delicious. “A plan!” I thought… and off I skied. So although I’d bought the newspaper, my failure to cart it halfway across the world meant an article I had already paid to read in print was now inaccessible to me. I couldn’t review it, couldn’t link to it from this blog, couldn’t share the link on Twitter… it was off-limits unless I paid again (which I could have but it cost more than $5, including tax, for 30-days access). To be fair, most of the Mail’s website is free to access (subscription on specific content was introduced in 2004) and I could have roamed around reading much of its content at will. And since I believe some sort of payment model will be introduced on newspaper websites at some point in the future surely should I really find this irritating? Maybe not, but my setback in sharing the article got me asking myself a question: Could charging to read online content mean we gain on the swings while we lose on the roundabouts? Of course, journalism and the world of finance have never been easy bedfellows – reporters regard those who pay the newsroom gas bill with a degree of suspicion – and, frankly, the whole paid content debate has been dealt with far more intelligently by other people than me. But my two penn’orth is simply this: had I been able to access that story, I’m willing to bet I would have driven traffic to it though linking and sharing the url, and I’m just one random reader. It might have generated Twitter conversation, maybe been saved a few times on social bookmarkink or linked to by other bloggers – it might have garnered far more readers as a result of being shared by a non-subscriber. In short, it had more possibilities and potential. And, finally, I wonder if the traffic potentially generated by a non-payment system might be more attractive to advertisers than the niche visitors they would be able to claim now? To me it makes sense to charge for access to archived content if your archive adds value, eg if it contains structured data that can be easily searched and put into context. Otherwise… dunno.